Re: Wildlife Seen on Your Last Walk? Jumped from the bankside vegetation into the creek, frog stroked for a bit then dived & buried itself in the leafy silty bottom...Back Creek, Beechmont, Qld. Wow!!! And Kermit thought it wasn't easy being green. Would have been great to see ofuros. Sharp intake of air, mouth open in surprise & my 4yo boy wondered what all the commotion was about ... a very unusual sight to see. Stubborn "little" *&%$#! 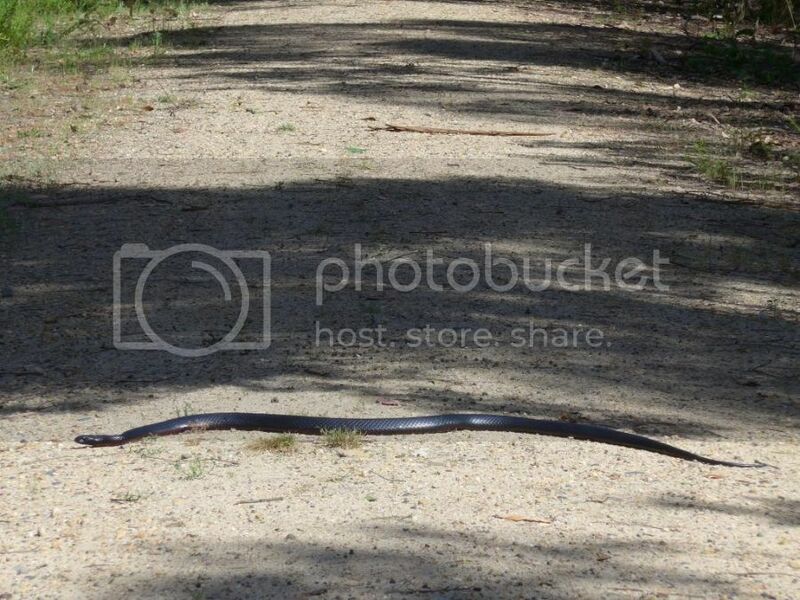 wouldn't get off the track, was about 1.5m long incl tail, somewhere along the cowan to berowra track just north of sydney. Most lizards I've encountered on my walks have bolted for the bush upon noticing me, this guy was bathing in the sun reluctant to move, once he finally did decide to move on it wasn't off the track and it wasn't fast, had to follow the thing for about 100m before he decided it was worth getting off the track and moseying its way up a hill. Guessing a Lace Monitor, type of goanna. Ah Yea that does look like it and sounds about right reading Wikipedia. Thanks! 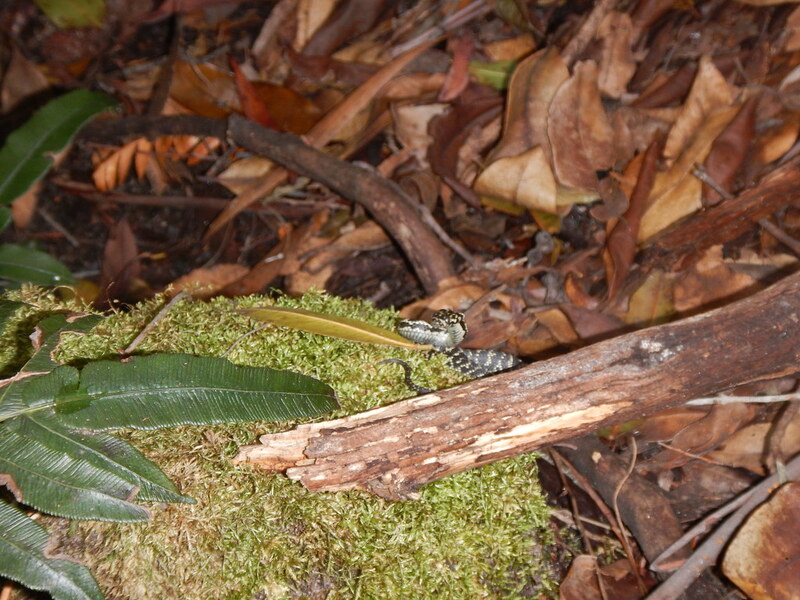 We spotted 2 juvenile brown snakes and a red belly two weekends ago on a Mt Bushwalker to Mt Talaterang Summit (rtn) hike. First time I've seen three snakes in one day of hiking. Getting to that time of year I guess! All three seemed quite content to move along or back away with a bit of noise (albeit slowly). Not the greatest of shots, but with Brissy's first rains in months forecast I had to head out for a rainy rainforest walk. The Giant King Crickets were out in force last night. Big buggers...short hoppers & very clumsy. Big fat tiger snake, one metre long trying to nip me. See my post --Snakes- they're back! Were they ever gone? in this sub. One metre isn't a big tiger. A fat one's as thick as my arm at the elbow joint. Spotted this season's first snake 2 days ago, a copperhead on swampy ground beside the Gippsland Lakes. The same place a few years ago I spotted the biggest tiger I've ever seen, at easily 2 metres, probably slightly longer. I grew up In Swifts Creek (Vic Alps foothills) where there are heaps of Eastern browns, amongst others. One spring, early summer we had near plague levels of rats. I sighted a Brown close to eight feet long but more interestingly it had 3 distinct rat sized bulges running down the length of it's belly. So well fed he could barely move. A 6 foot+ Red belly on the East Gippsland Rail Trail. A beautiful creature. He matched the high gloss carbon fibre finish on my pushbike. The photo doesn't really do justice to his graceful movement and sheen and vivid red colouration. I approach all snakes with respect, awe, curiosity and admittedly a tinge of initial alarm and fear. Back in 2014 I was having lunch at the top of Tarros Ladder (Blue Mountains) when this lizard came right up to me. This was during a dry spell, so the lizard might have been attracted by my water bottle. It pottered around while I was eating my lunch, then when I wasn't looking it bit my toe hard (I was wearing sandals). Instinctively I kicked my foot out, and the lizard flew through the air, landing a few metres away. It came back straight away, though not quite so close. I didn't stop watching it this time. Wow, some great snaps in this thread! Anyone ever seen/heard of kangaroo encounters in the water like this? I have read old accounts of a tactic used by kangaroos to defend themselves from dogs. They would go into a waterbody and when the dogs swam out to attack the kangaroo would grab the dog in their front paws and disembowl the dog with a kick of the lower legs. You see this tactic in video of male kangaroos fighting. The water enables the kangaroo to balance better with its tail and makes the dog(s) less agile. Had a very similar experience with a large buck grey 'roo and a farmers dog a few weeks ago.....I was camping on a property near the river doing some sambar hunting and the farmers red cattle dog came down to say hello and then proceeded to do a sneak on a large male grey 'roo that was sunning itself on the nearby hill. The 'roo noticed the dog & went straight to the river going into a pool about waist deep and gave the old "come closer" invitation to the dog with his muscular and well-clawed front legs. This dog was pretty 'roo savvy and just stood off on the bank barking at it but I went over anyway and called the dog off and a few minutes later the 'roo left the river and returned to his sunny spot on the hill. Cunninghams Skink, track to Taffys Rock, off GNW. He wanted a handout. Yep, the water tactic employed by the threatened Roo is about drowning the dog rather than disembowellment. Being the roo can keep his feet on the ground while the dog has to errr...dog paddle...the Roo gets hold and leans on the dog till death or at least it loses interest. I know they're pretty common but still cool when you get to see them. Happily sunning itself on a rock today in Heathcote NP. Also today, I had my second snake encounter within the last month. They really are out and about. Introduced wildlife...a glimpse of a reclusive red fox on my walk last night. Startled this bloke a bit, but he was just chilling. Noatak River, Gates of the Arctic NP, August 2017. 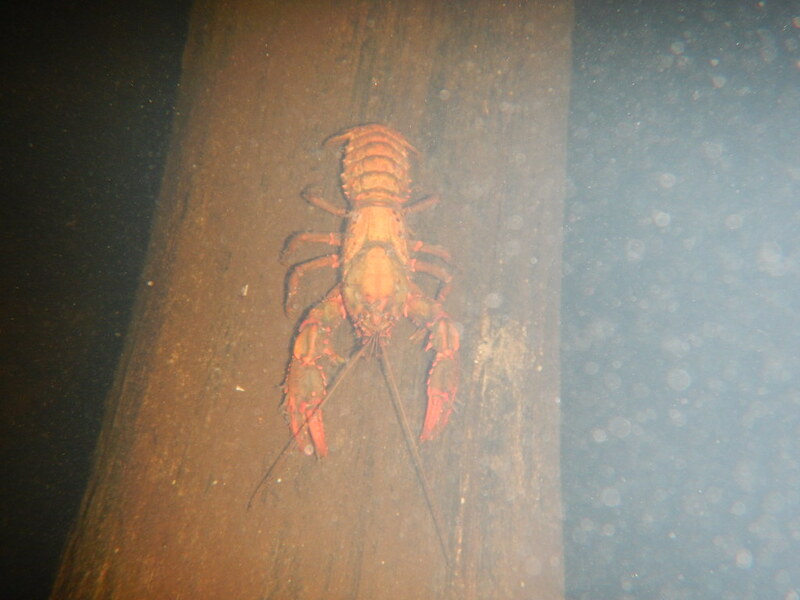 That's not a Yabby...THIS IS A YABBY. This one was walking across a large rock shelf on OHares Ck in Dharawal NP. Cacophony of Cicadas...Koreelah NP, S.E. Qld...this morning. I had to put a couple of jelly beans in my ears to muffle their noise ....boy they were loud ! Yellow monday. Greengrocer etc etc...Think these were Razor Grinders, but always up for more schooling if I'm wrong. Saw a gang gang cockatoo for the first time. Was feasting on wattle seeds at Hartley Reserve, highway end of Jenolan Caves Rd. Neo wrote: Saw a gang gang cockatoo for the first time. Was feasting on wattle seeds at Hartley Reserve, highway end of Jenolan Caves Rd.